HARSHA V. SINGH, International Institute for Sustainable Development. Rapid growth of world trade and investment has helped stimulate a new generation of globally-prominent economies. Deeper economic interdependence through trade co-exists with efforts to increase economic dominance by both established and newer economic rivals. These developments have given rise to a new trade agenda with a potential for both conflict and coherence. Canada can play an important role in shaping the global economy so that trade policy moves away from fragmentation and conflict to become an engine of prosperity, inclusive growth and sustainability. 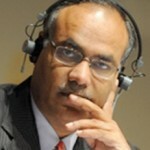 Harsha V. Singh is currently a Senior Fellow at the International Institute for Sustainable Development based in Geneva. He was the Deputy Director-General of the World Trade Organization from 2005 to 2013, where he was responsible for trade in agriculture, services, environment, technical barriers to trade, sanitary and phytosanitary measures, and electronic commerce. He has also served as Chair of WTO dispute settlement panels. Dr. Singh is past Secretary of the Telecom Regulatory Authority of India and played a key role in the reform of the Indian telecom sector. For the 2013-14 academic year, he has been appointed Adjunct Professor of International and Public Affairs at the School of International and Public Affairs, Columbia University. He holds a Ph.D. in Economics from Oxford University. * Please note: Photos and/or video recordings of this event may be posted on the CIPS website, newsletter and/or social media accounts.